Noodles, cheese and a tasty tomato and meat sauce are layered and topped with more cheese and baked until the cheese has melted. Lasagna was one of my all time favorite childhood meals. I had been holding off trying to make one by myself for some reason but the cravings finally got the better of me and I had to make one. 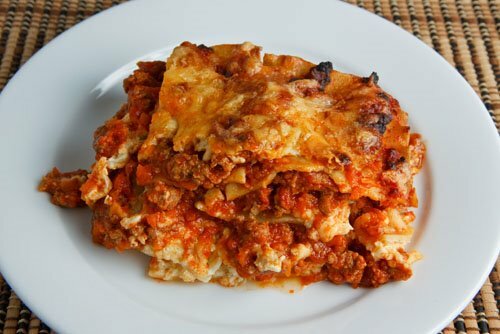 A lasagna at its base is a dish that is made of layers of sheets of pasta with various fillings in between each layer. The more common lasagne often have layers of tomato sauce or meat sauce and layers of cheese. The cheese layers are often made from ricotta or a bechamel sauce but I had always had it made with cottage cheese so that is how I decided to go with mine. For the meat sauce I kept it simple and I added some ground beef to a simple marinara sauce . I also had some leftover Italian sausage in the freezer that needed finishing so I added those as well. I like using Italian in soups and sauces as they add a ton of flavour. With that I pretty much had everything. Because you have to make a meat sauce and a cheese mixture and cook the noodles and assemble the lasagna and then bake it, it takes a bit of effort and time and it is best suited for a weekend. Despite the effort that it takes it is well worth it! It is really hard to beat a baked pasta dish with a golden brown layer of melted cheese on top. Layers of a tasty tomato and meat sauce and layers of savoury melted gooey cheese make it even better. I served my lasagna with some garlic bread and a salad. One of the things that I like most about making lasagna is all of the leftovers. I have enough leftovers for lunches and dinners for the rest of the week and beyond. This will be a tasty week indeed. Brown the meat in a large sauce pan, drain off any excess grease and mix into the marinara sauce. Boil the noodles as directed on the package. Mix the eggs, cottage cheese and parmigiano reggiano in a large bowl. Spread 1/2 cup of the meat sauce over the bottom of a baking dish*. Place a layer of noodles on top. Place 1/2 of the cottage cheese mixture on top. Place 1/3 of the mozzarella on top. Place 1/3 of the meat sauce top. Place the remaining cottage cheese mixture on top. Place the remaining meat sauce top. Place the remaining mozzarella and parmigiano reggiano on top. Note: I use an 8 in square baking pan and the lasagna was a half an inch over the top before I put it in the oven so this will work perfectly for a 13 by 9 inch baking pan as well. My mother is famous in my circle of friends for her lasagna. It’s what gets all of us together whenever she comes to visit. This makes me miss her. I was interested to see what cheeses you use…I love when cottage cheese makes it in. The very first dinner party I ever gave (I was 16) was lasagna, garlic bread and Caesar salad. Thanks for bringing it all back to me and thanks for sharing with Presto Pasta Nights. Can’t go wrong with lasagna!! Lasagna makes everything in life better. Yours looks delicious! That lasagna looks sensational! I find meaty lasagna a bit filling so I usually make mine without meat. The secret to keeping it rich tasting is to stir shredded cheese into the sauce. My husband makes the best lasagna I have ever had…but yours sure does look fabulous. Finally, someone that uses cottage cheese in their lasagna! I grew up with it made that way and it’s my favorite. I can’t wait to try this recipe out. Even though it is hard work, it makes huge portions too so you’ll have leftovers for three days! Lasagna is always wonderful comfort food. Yours looks quite tasty and reminds me of bundling up in the winter and eating hearty foods! Sounds so delicious Kevin. My whole family love lasagna. Beautiful lasagna! And it is usually even better the next day. It is also one of my all time favorite childhood meals! Your lasagna look ever sooooo good! Can I use something else in place of the cottage cheese, which I do not like. I love lasagna with white sauce. I will try your recipe because it looks tasty ! Looks fab! I am such a cheater; I usually don’t precook the noodles and I use jarred sauce, but it’s still “homemade” enough. Lasagna’s so versatile, too; you can add all kinds of crazy stuff. My favorite last fall was swiss chard lasagna. Yummy yum yum – lasagne! Yours looks good! Lasagna is one of my favorite meals. I love that it makes lots of leftovers as well! Good god Kevin, that looks like the most delicious Lasagna in the world! I use cottage cheese as well! Hey the Lasagna looks amazing..
Kevin ,this lasagna look good!! Nothing beats a classic lasagna!!! Yours looks delicious!! Your lasagna look delicious. And crispy pieces too, my favorite!!!! Your lasagna looks very tasty indeed Kevin. I can see I missed a lot of good cookin whilst I was away in America. Everything on your page looks delicious! Lasagna is one of my favorite dishes, too. Great picture! It’s definitely hard to beat a baked pasta dish, and that’s a great looking piece of lasagna! Mmm. Kevin. Isn’t comfort food wonderful? Lasagne is also one of my favorite foods to make — so therapeutic! The process is a bit like a meditation when you do it from scratch. Your lasagna looks great. I’m sure it’s worth all the hard work. And lasagna is so hard to photograph too! But you totally nailed it. My grandmother made the most awesome lasagna on the planet. I’ve never tried it. Yours looks great! Lasagna is always good!! I never get sick of it because there are so many variations! Thank you for not using the no-boil noodles. I find them totally distasteful. My Italian hubby would cringe at the thought of cottage cheese in lasagne, though. One nice thing about lasagne is that you can make it, then freeze in small baking dishes. Yes, it’s a lot of work, but if you make a big batch and freeze you’ve got some great meals waiting for you. It’s worth all that effort because you can eat it for days and days and days! I found this post at the perfect time – I premade lasagna last night to serve tonight. I made a spinach and mushroom lasagna as we can’t mix meat and milk in our kitchen. But yours looks outstanding and I do always crave a meat sauce lasagna. Nice job. 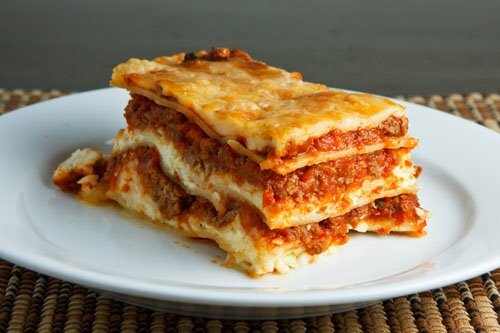 Isn’t this dish called lasagne since there are more than one sheets of lasagna? I think so. I’m sure of it, actually. The picture of the lasagne looks absolutely perfect. You rock! I always fail at cooking lasagna. But yours seems scrumptious. Maybe it encourages me to try once more. When I die, my last meal better include Lasagna. That looks amazing, Kevin. Cold lasagne sandwiches all round…..
My mom makes her lasagna with cottage cheese so I like that too! 🙂 This is definitely one of our (my hubby loves it!) favorite dishes! Anonymous: You can use ricotta cheese instead of the cottage cheese if you prefer. It is one of my favorite meals as well! Its so versatile too! My mom always made cottage cheese lasagna, so this reminds me of my childhood! I could eat this every day for a week, too! This is one of my favorite dishes ever. Yours looks great. Never had it with cottage cheese! It looks fantastic! Can’t wait to try your recipe! Thanks! These pictures just sent my hunger into overdrive. Yum! That’s one very photogenic lasagne! 🙂 I haven’t made lasagne in ages – mostly because the weather is still quite warm here. My mom used to make it quite often and my favourite part was always the slightly crispy edges. I've never tried my hand at Lasagna, but that sooo looks worth the effort. Man! This lasagna is a killer..
Hey man, absolutely love your site, and great photos too! My lass and I love to make your okonomiyaki. With lasagne, I like to add a little smoked paprika in to the mix too. One more thing, you are a genius!! !